Introduction A catastrophic 35% increase in the burden of breast cancer in Kenya has been predicted by 2025. Mitigating this burden is critical, and local research is necessary to generate the evidence to inform policy, public health and medical practice. Most of the knowledge available has been derived from studies in high-income countries that are not directly applicable due to economic, social, cultural and ethnic differences. At the time of writing this paper, we had no knowledge of any longitudinal cohort studies in sub-Saharan Africa of both breast cancer survivors and a matching cohort of women who have never had a diagnosis of cancer. We aim to assess feasibility of cohort studies in Kenya that consider clinical characteristics social determinants and individual health seeking behaviour. Methods and analysis This study aims to inform best practices for initiating a longitudinal cohort study in Kenya. It is a two-pronged, prospective mixed methods study of women with and without a diagnosis of breast cancer with baseline data collection and one follow-up data collection approximately 3 months later by telephone. Quantitative and qualitative data will be collected concurrently, analysed separately and together to enrich understanding of concepts by triangulation. We aim to include 800 women aged 30–60 years: 400 in the survivorship cohort and 400 in the non-cancer cohort. Two focus group discussions from each cohort will be carried out to enhance understanding of concepts and to guide recommendations. Ethics and dissemination Independent ethical approval was obtained from Kenyatta National Hospital-University of Nairobi Ethics and Research Committee and the Research Triangle Institute International. Only consenting participants will be enrolled. Counselling support, debriefing discussions and referrals for formal support services will be available for both participants and research assistants. Findings will be disseminated through publications, websites and presentations. This is a feasibility cohort study that includes women who have had a diagnosis of breast cancer and a group of women who have never had a diagnosis of breast cancer. Our questionnaires are based on previously tested concepts and questions that will be adapted for the local setting, and subjected to cognitive testing to ensure appropriate language is used to facilitate comprehension. To perform a comprehensive assessment, we include data elements to capture social determinants and individual health-seeking behaviour. For the survivorship group, recall bias will be minimised by limiting the inclusion criteria to 3 years since diagnosis. The study will be conducted in Nairobi (the capital city of Kenya) and its environs where cancer management services are concentrated, and our findings may not be a true reflection of the entire country but a reasonable starting point for extension to other regions. Paucity of breast cancer research in Kenya and the sub-Saharan African region in general has resulted in an inadequate local evidence pool of knowledge that could be referred to for locally relevant interventions and resource planning. 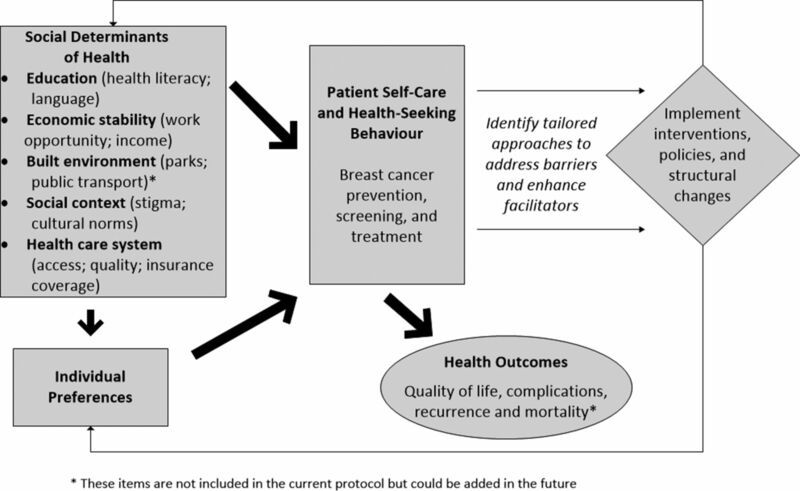 Breast cancer-related interventions are currently planned using a top-down approach rather than a bottom-up consultative approach that systematically evaluates the factors that impact health-seeking behaviour in the targeted population. There is growing acknowledgement that the social determinants of health affect self-care and health behaviours. Social determinants are the conditions in which people are born, grow, live, work and age. They include factors like socioeconomic status, education, the physical environment, employment and social support networks, as well as access to healthcare.5 Understanding individuals’ social determinants is essential to creating programmes that address potential barriers to healthcare and improve overall health. For example, socioeconomic status can determine whether cost is a key barrier to obtaining health services; education levels can impact health literacy and self-care behaviours; and social support networks can perpetuate stigma and delays in seeking care. Social and cultural obstacles, if not considered, may impede the success of any cancer care programme.6 In addition, there is limited knowledge on individual level breast cancer risk factors including family history, reproductive history and lifestyle factors. Cohort studies could provide evidence-based knowledge to understand and address these factors that impact access to high-quality care. In 2010, Holmes et al published the need to establish cohorts in Africa in order to explain disease aetiology and to support the development of prevention and control measures specific to the region.7 Optimal design tailored to the local environment can support longitudinal data collection. In 2015, Dalal et al 8 found that it was feasible to conduct large cohort studies in sub-Saharan Africa, and mobile telephony with its growing penetration and accessibility into communities, may be particularly useful. In their study face-to-face interviews were very successful in Uganda, use of postal services or email were a challenge in Tanzania with low return of questionnaires by post attributed to relative scarcity of post offices. Intermittent internet access in the region may also hinder questionnaire distribution and return. There is an urgent need to conduct breast cancer studies in Africa, and the objective of this study is to assess the feasibility of initiating a breast cancer cohort study in Kenya. We will recruit participants, perform baseline assessment and conduct short-term follow-up at approximately 3 months after baseline data collection. Findings from this study will provide important lessons to tailor future longitudinal studies to the local environment to ensure successful recruitment and long-term follow-up. The few breast cancer cohort studies conducted in sub-Saharan Africa9–12 have only enrolled women already diagnosed with cancer that does not provide opportunities to systematically evaluate the ability to prevent and screen for breast cancers. To address this gap, the current study will include both breast cancer survivors and a cohort of women who have never had a diagnosis of breast cancer. The cohort of women with a diagnosis of breast cancer will provide important evidence on access to breast cancer treatment and patient experiences. However, the cohort of women without a diagnosis of breast cancer will provide valuable information on access to breast cancer screening services and their knowledge of breast cancer symptoms to enable early stage diagnosis. Our overall goals are to explore feasibility of conducting a breast cancer cohort study in Kenya and assess ability to collect information on social determinants and individual health-seeking behaviour. We intend to identify barriers and propose interventions to improve women’s access to cancer prevention, treatment and survivorship care services in Kenya. To establish feasibility of identifying and recruiting individuals to participate in a cohort study who have had a diagnosis of breast cancer within the past 3 years at the time of recruitment to minimise recall bias and a similar group of women who have never had a diagnosis of breast cancer. To determine the ability to maintain contact for follow-up assessments by conducting outreach by telephone (preferable mobile phones) at 3 months after initial contact. To obtain baseline information on social determinants of health, breast cancer risk factors, health-seeking behaviour related to breast cancer screening, treatments received and quality of life. We are conducting a feasibility study to inform best practices for initiating longitudinal cohort studies in Kenya. The study will include women with and without a diagnosis of breast cancer in separate cohorts. We will collect baseline data and conduct one follow-up data collection (at approximately 3 months by telephone). We will use a mixed method approach and collect both qualitative and quantitative data. Figure 1 presents the framework for assessing social determinants, and individual preferences, risk factors and treatment patterns in impacting breast cancer outcomes. This framework served as the theoretical underpinning for developing the data collection instruments for baseline data collection. Understanding the causal pathways of the determinants of health are essential to identify the root cause of health problems and to identify tailored interventions.13–15 Over the long term, policies can also be implemented to drive structural changes to modify the social determinants themselves, for example, increasing the overall education level in the target population. In this study, we will capture information regarding social determinants, risk factors and health seeking behaviour to identify potential hypothesis that can be evaluated in future longitudinal cohort studies to develop targeted interventions and policies. Social determinants, and individual preferences and risk factors to improve breast cancer outcome. The questionnaires to be used in this study were largely based on prior surveys and include several validated instruments. Table 1 summarises the components included in the questionnaires and provides details on the source of the questions. We reviewed published literature on key concepts and also solicited expert opinion to further tailor the content for the Kenyan setting. Using the questionnaires, we will obtain information on participant’s background (demographics, socioeconomics and health status), risk factors (using breast cancer risk assessment tool), insurance status and employment, breast cancer knowledge (using breast cancer awareness measure tool), breast cancer treatment and quality of life (using National Comprehensive Cancer Network Functional Assessment of Cancer Therapy – Breast Cancer Symptom Index – 16 [NCCN FBSI-16] [version 2] tool for physical, emotional and functional well-being) and access to care. We included multiple questions that address the same construct to ensure comprehensive data collection and to assess internal consistency. Cognitive testing will be performed to support reliability and validity of the questionnaires. We will conduct one-on-one interviews of about 60 min each to perform cognitive testing with 10 individuals with a diagnosis of breast cancer and 10 individuals without a diagnosis of breast cancer. The cognitive testing will assess clarity and the ability of the interviewees to understand the questions and provide accurate responses. Participants will be instructed to listen to each question and then convey to the interviewer which response or responses applied and justify the selection of their response so comprehension can be assessed. Following the completion of the questionnaire, the interviewer will probe the interviewee on any aspects of the questionnaire that proved difficult or confusing for the respondent. We will also ask each participant some additional debriefing questions about the length and burden of the questions and their feelings about the content of the questions. The findings from the cognitive testing will be used to tailor the wording in the draft questionnaires to clarify the information required and remove any ambiguity. We will also take steps to reduce the length of the survey if the number of questions prove to be burdensome to the participants. In addition to this, we will also perform one-on-one interviews with up to 20 women to ensure the content of the questionnaire adequately addresses issues faced by women diagnosed with breast cancer. A maximum of 40 participants will be included in the cognitive testing. The study targets women aged 30–60 years in four purposively selected counties of Kenya: Nairobi, Kiambu, Machakos and Nyeri. This age group has a high incidence and prevalence of breast cancer.16 Data from the Nairobi Cancer Registry for the 5-year period, 2007 – 2011,3 show that the highest percentage of breast cancer diagnoses was among women in the 40–49 years age group at 29%. Ten years before and 10 years after was 20% and 24%, respectively. This makes a total of 73% of all the breast cancer diagnoses in that period, and this age group is recommended to undergo breast screening via clinical breast exams or mammograms. We will include women who voluntarily give consent and are able to provide contact information so that we can conduct 3-month follow-up interviews over the telephone. We will exclude women who do not speak and understand the study languages—English and Kiswahili. Kiswahili is the national language, and majority of women between the ages of 30 years and 60 years are conversant in either English or Kiswahili. We determined that a sample size of 400 each would be adequate for the cancer and non-cancer cohorts based on a 95% CI where the margin of error is ±5%. Sample size=(Z-score)2 * p*(1-p) / (margin of error)². Sample size adjusted=(sample size) / (1+[(sample size–1)/population]). Z-score=1.96 for confidence level 95%. Proportion (p) is not known, so we used 0.5 based on common practice. The above calculation gives us a sample size of 306 for the cancer cohort. We assumed that 80% of the cohort will be contacted via telephone to perform follow-up interviews to bring the sample required to 383. We included a 5% mark up for non-response that results in 402 respondents, and we rounded this to 400 patients. We will select an equal number of breast cancer and non- breast cancer participants for a total of 800 women overall. We will recruit women diagnosed with breast cancer through the membership lists maintained by our partner organisations: Kenya Cancer Association (KENCANSA) and Kenya Hospices and Palliative Care Association (KEHPCA). We will also recruit breast cancer survivors from Kenyatta National Hospital (the main teaching and referral hospital in Kenya), private hospitals and palliative care units. The group of women not diagnosed with breast cancer will be recruited through members of KENCANSA and KEHPCA and also through general outreach. After eligibility assessment, consecutive women meeting the recruitment criteria will be approached by the trained research assistants for consent to participate. The research assistants will provide information as per prepared consent forms. Face-to-face interviews will be held either at the same location on the same day of recruitment or at a later time or day with an appointment; in each case, consent will be obtained immediately before the interview. Research assistants will obtain signatures or thumb prints for those who can write and those who cannot write respectively. Participants will be given a copy of the consent form and will be offered financial support to travel to the interview site. The initial face-to-face baseline interviews will be followed by a one-time follow-up by telephone approximately 3 months later. Two focus group discussions (one from a higher and another from a lower socioeconomic population) from each cohort will be carried out to enhance understanding of key issues of concern and to better interpret results from the quantitative analysis. Recruitment and data collection will be from November 2017 to June 2018. This study was conceptualised based on priorities, experiences and preferences that women exhibited or shared during interactions with partner organisations, KEHPCA and KENCANSA, and individual study team members. The study team includes one breast cancer survivor and one family caregiver of breast cancer survivors. We have described focus groups in the study protocol to ensure patient (breast cancer survivors) and public (individuals without breast cancer diagnosis) feedback will be incorporated in interpreting the study quantitative findings. We plan to share the study results through postings on KEHPCA and KENCANSA websites. Data processing and analysis will start in the field by checking for completeness of the data and performing quality control checks and sorting the data by instrument used. Data from the breast cancer and non-breast cancer cohorts will be compared for any similarities and differences in terms of demographics, socioeconomic factors, breast cancer risk, insurance and financial burden, employment status, access to treatment and comorbidities. We will conduct χ2, t-tests, analysis of variance or appropriate non-parametric tests to determine differences between the cohorts. These differences will be further explored using multivariate analysis to control for potential confounders between the two groups. Additionally, regression analysis will be conducted to evaluate health-seeking behaviour, factors impacting decision making concerning cancer care and patient self-care attitudes. Furthermore, we will assess quality of life among breast cancer survivors using the standardised scoring for the NCCN FBSI-16 (version 2) and compare with scores available from other breast cancer survivors. We will also determine the level of breast cancer knowledge among the non- breast cancer cohort by analysing the concepts in the Breast Cancer Awareness Measure. Potential confounders in this cohort study would be age and economic stability, cancer stage at diagnosis, comorbidities and treatment options applied. We have minimised on overexclusion to retain sufficient sample size—women of 30–60 years of age are included. In the questionnaires we have stratifier questions on economic stability, cancer stage at diagnosis, comorbidities and treatment options applied. At analysis we will adjust for these confounders. We plan to conduct four focus groups discussions; two focus groups with breast cancer survivors and another two with those without a previous diagnosis of cancer. We will recruit 8–10 participants per group. We have developed focus group discussion guides to explore key concepts related to breast cancer screening, diagnosis, treatment and survivorship care for breast cancer. Barriers and facilitators will be specifically explored during these focus group discussions. This information will help us with contextual details to interpret the quantitative data that will be collected. We will use NVivo to develop coding tables to categorise the unstructured qualitative data. Two grant researchers will independently assess the crosswalk between the codes and qualitative information to determine consistency. We will also use flow charts, concept mapping, word clouds and concept counts to explore the data visually. Qualitative feedback from the focus group discussions and the individual interviews will inform the study conclusions and recommendations. This is a collaborative study by Research Triangle Institute (RTI) International, KEHPCA and KENCANSA. Only consenting participants will be included, and plans are in place to refer participants to a hospice or palliative care unit for counselling in the event that they feel psychologically or emotionally distressed during the discussions or interview. Data collectors will also have access to hospices and palliative care units for debriefing. Findings will be disseminated by publication in peer-reviewed journals, through oral and poster presentations for various audiences, websites and scientific meetings. This is a prospective, cohort feasibility study of women with and without a diagnosis of breast cancer in Kenya to evaluate the approach of using face-to-face interviews and follow-up telephone calls to collect longitudinal data. This short follow-up study will provide valuable feedback on the feasibility and best practices to establish longitudinal cohorts in Kenya and the region. Additionally, we will also expand traditional data collection beyond demographics and clinical information to also obtain data on social determinants and individual health-seeking behaviour. Social determinants as described in the background of this paper and individual health-seeking behaviour have a direct impact on the implementation of interventions for reducing the burden from breast cancer. Interventions developed with disregard to these determinants may face low uptake or even rejection. There is need to embrace implementation science research that addresses determinants of intervention adoption in the real-world setting. Cohort studies have not been previously established in Kenya and many other sub-Saharan Africa countries because of the challenges in maintaining participant contact and the high cost of running these studies. With increased mobile telephony, we presume that continued recontact of participants is feasible. The high cost of cohort studies needs to be evaluated against their benefits if findings could inform optimal interventions for disease mitigation. Cancer incidence and mortality is rising at an alarming rate, and there is need to find ways of reversing this trend using various evidence-based approaches. Stigma associated with breast cancer may limit women’s willingness to participate in this study, but we will ensure proper communication of research procedures and benefits. We will maximise recruitment through close collaboration with breast cancer support groups, palliative care service providers and healthcare workers in both public and private institutions. The study locations are within or in close proximity to Nairobi county, and therefore, our findings may not be generalisable to the entire country; the findings from this study will serve as a baseline assessment that can be extended to other counties in the future. We will collect data on cancer treatment, and therefore there could be recall bias; we have specifically decided to interview women who have received treatment in the past 3 years to minimise recall bias. Women interviewed may not want to respond to all questions posed, and therefore there could be missing data for certain fields as we analyse the data collected. The findings and lessons learnt from this feasibility study of 800 participants with short-term follow-up will provide a road map for future cohort studies in Kenya and the region. Local evidence on breast cancer prevention, screening and treatment is critical for tailored public health and medical interventions to address the growing burden of breast cancer. RTI International, Kenya Hospices and Palliative Care Association, their membership and affiliated palliative care units. Kenya Cancer Association (KENCANSA), their membership and affiliated support groups.
. Global cancer observatory: cancer today. Lyon, France: International Agency for Research on Cancer, 2018. National Institute of Health, National Cancer Institute. Surveillance, epidemiology and end results programme. 2017. https://seer.cancer.gov/statfacts/html/breast.html (cited 23 Feb 2018). Kenya Medical Research Institute. Nairobi cancer registry report (2007-2011). Breast cancer incidence among women in Nairobi, Kenya. 2018. Ministry of Health. National cancer control strategy 2017-2022. 2017. http://kehpca.org/wp-content/uploads/KENYA-NATIONAL-CANCER-CONTROL-STRATEGY-2017-2022.pdf (cited 18 Nov 2018). Kenya National Bureau of Statistics. Kenya demographic and health survey 2014. Nairobi: Kenya National Bureau of Statistics, 2015:440–1. Cancer.gov. Breast cancer risk assessment tool. 2017 https://www.cancer.gov/bcrisktool/ (cited 19 Jul 2017). Facit.org. Questionnaires. 2017. http://www.facit.org/facitorg/questionnaires (cited 19 Jul 2017). Contributors RG, SS, ZA and AK conceptualised and designed the study. RG and SS carried out literature review and drafted the manuscript. EO gave considerable input on data analysis procedures. ZA and AK made substantial input on ethical considerations. AWK, NG and FK contributed to mapping of study sites, reviewing and editing of study tools. All authors have read the manuscript for its intellectual content and given approval for submission. Funding This work was supported by RTI International. Ethics approval Independent scientific and ethical approval was obtained from the Kenyatta National Hospital – University of Nairobi Ethics and Research Committee and the Research Triangle Institute International Independent Review Board.